The team started the week strong with a 4-0 shutout over the Buffalo Sabres. The shutout marked goaltender Craig Anderson’s second of the season and 28th as a Senator. He’s just two back of Patrick Lalime for the organization’s shutout record. It’s also his 42nd career shutout, landing him 39th all-time. Facing off against the Florida Panthers, the Senators fell 5-2 despite Brady Tkachuk’s 20th goal and 40th point of the season. Finally, they played the Toronto Maple Leafs, beating them for the second time in two weeks by a score of 4-2. 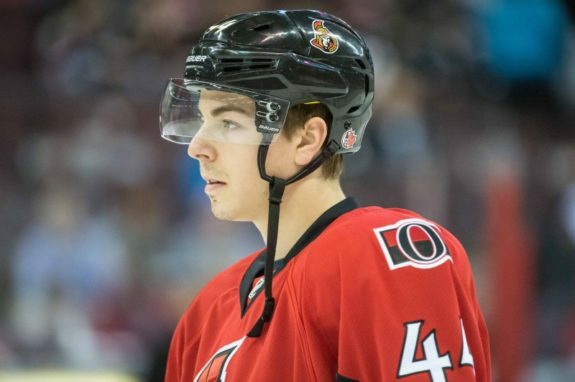 During training camp, the Senators took a serious blow when Jean-Gabriel Pageau tore his achilles. The injury looked to take him out for the 2018-19 campaign, yet Pageau returned after missing just 42 games. Much better than a full season. For overcoming this setback, the 26-year-old has been named the Senators’ Bill Masterton Trophy nominee, voted by the Professional Hockey Writers Association members for Ottawa. Anderson won the award in 2016-17, for finishing the season after leaving when his wife Nicholle was diagnosed with cancer. He is the lone Senator to be awarded the Masterton Trophy to date. Since returning from injury, Pageau has three goals and 10 points in 35 games but has been shooting at a career-low 4.0 percent. His average is 9.3. His faceoffs have been above average though, winning 53.46 percent of his draws. One area that the Senators look strong for the future is in net. From Marcus Hogberg to Filip Gustavsson, and from Arizona State University, Joey Daccord. Daccord was on fire this season, going 21-12-1 with a 2.36 goals-against average and a .926 save percentage. The seventh-round pick from 2015 has been named a finalist for the Mike Richter Award as the top goalie in the NCAA. This comes after he was also named a nominee for the Hobey Baker Award, although he was not a finalist. It has been discussed that the team will try and sign the 22-year-old, but it’s important to note that the team has just one contract spot left. They’ve also stated that they’re looking to sign Josh Norris and Swedish forward Joakim Nygard, who we’ll get to shortly. Senators general manager Pierre Dorion and goalie coach Pierre Groulx reportedly went to Arizona State’s game on Saturday to watch Daccord in the NCAA Tournament. Daccord’s season came to an end after Saturday’s playoff match versus Quinnipiac. 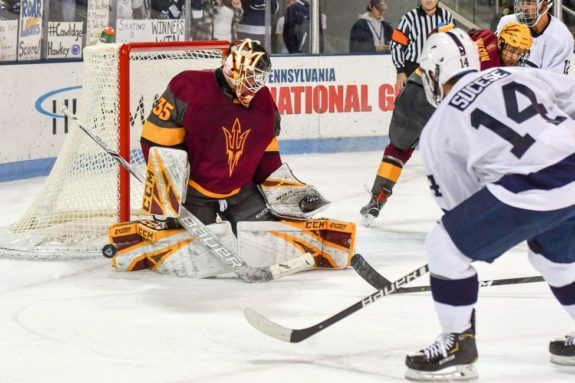 The ASU goaltender faced 38 shots in the 2-1 defeat. The playoff game was ASU’s first NCAA Tournament game in the program’s history. As mentioned, the Senators have shown interest in Nygard. Nygard is currently playing for the Farjestads BK Karlstadt of the Swedish Hockey League and had 21 goals and 35 points in 52 games in the regular season. Both of those totals are career highs. Dreger compared Nygard to Carl Hagelin, noting that the left winger has elite skating ability and can “flat out fly.” He has played 325 games in the SHL, collecting 147 points, while adding 12 points in 11 playoff games. He’s also played in the SuperElit for 92 games, totalling 102 points. The 26-year-old would require a one-year, entry-level deal if he were to come into the NHL, and may be a good choice for the Senators, who will need to fill the roster in order to properly develop some of the young players in the system. It’s finally here, the last week of the regular season for the Senators. While many have been waiting for this season to end, there are still four games left for them. They’ll face off against the Presidents’ Trophy-winning Tampa Bay Lightning, New York Rangers, Sabres and Columbus Blue Jackets before the busy offseason begins.